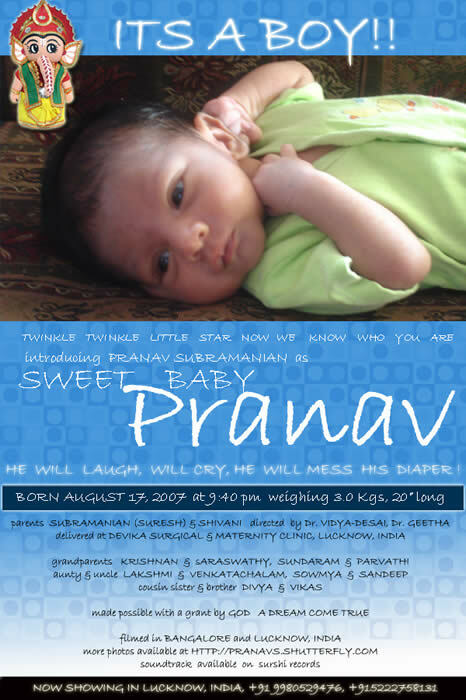 Pranav has brought happiness to everyone in the family with his birth. Born to my second cousin Subramanian Krishnan (Suresh) and Shivani on 17th August 2007, at Lucknow in Uttar Pradesh, India, Pranav weighed 3 kg and 20” at birth. Suresh is a young enterpreneur based in Bangalore and is the son of my Paternal Uncle K. Subramaniam's Co-brother Shri Krishnan and Smt. Amba.